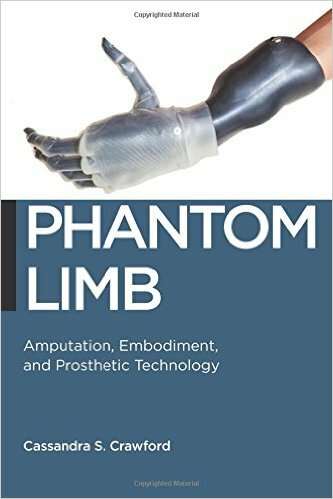 The title of this important book gives only the slightest hint of the extraordinarily complex account that Crawford has produced about the biopolitics of limb absence and other forms of acquired limb loss, the meaning of phantom sensation and phantom pain, and the work of scientific knowledge-making in constructing experience and persons. Crawford organizes her book both as a history of biomedicine’s overall construction of limb loss and as a series of disciplinary encounters between different medical specialties struggling over how to delimit and explain the experience of limb loss. In the United States, amputation and phantom sensation became a concern to biomedicine as a result of the mass injuries and limb loss sustained by soldiers during the Civil War. This period produced one of the first large-scale attempts to offer prosthetic limbs to people with limb loss, and as the manufacture and utilization of prosthetics increased, an interest in the biomedical needs and challenges experienced by prosthetic users also grew rapidly. This was also a period of increased attention to neuroscience and the linkages between nerves and the self (Phineas Gage’s accident with a railroad spike happened in 1848). Silas Weir Mitchell, an American physician and neuroscientist, treated Civil War casualties and was the first to seriously study the phenomena of phantom limb sensation. He prepared detailed reports about sensations experienced by persons with limb loss and the potential clinical effects those sensations might have on prosthetic utilization. From this initial clinical attention Crawford explores how different clinical specialties have constructed limb loss and sensations associated with it. Throughout the book Crawford describes with precision, the process of how scientists and clinicians create meaning and experiences for patients and the public. As scientific regimes of knowledge change, both through innovation and discovery, and because human experience leaks through the various taxonomic containers that are developed to discipline it, researchers and clinicians propose new systems to encompass these transitions and transformations. Crawford is particularly insightful in describing how phantom sensation, often reported as pleasurable and helpful, became understood as phantom pain and emerged as one of the most significant post-amputation experiences reported by clinicians. When phantom sensations—the experience of ghostly digits and limbs—were first reported by people with limb loss, scientists and clinicians (I’m using these terms loosely) busied themselves with classifying and theorizing the origins, meanings, morbidity, and potential of phantoms as a way of building a set of knowledges and practices about bodies, minds and brains. By the middle decades of the twentieth century, phantom sensation began to give way to phantom pain: apparitions of missing limbs were no longer simply enlivened, but were contorted and painful. In initial formulations the pain was attributed to the posture or position of the absent limb at the time of the amputation. As the nineteenth century gave way to the twentieth, this approach, which suggested an association between the absent limb and the body’s peripheral memory of its amputation, shifted towards a more psychodynamic approach in which the pain of the missing limb could be interpreted symbolically as the mind’s inability to accept its loss. But beyond this psychoanalytic approach phantom pain became emergent in relation to the development of pain as a medical specialty with all of the developments in measurement, classification and treatments that the growth of a new specialty entails. Crawford associates the emergence of pain within phantoms as a result of more sophisticated understandings of pain generally by physicians. She describes the way in which this new phenomena (phantom pain) was classified in terms of intensity through her discussion of the development of the McGill Pain Questionnaire (MPQ). The MPQ was designed to link specific symptoms (in this case kinds of pain) to specific disease processes. Because phantom “pain” could not correlate with a specific process—in part because of the very absence of the part that suffered—its presence added dimensions to understanding the ways that pain operated and could be experienced, and led to novel interventions pushing the treatment of symptoms associated with limb phantoms out of psychodynamic specialities and into pain management and neurology. For instance at Walter Reed, where I do my research, phantom pain is treated with anti-seizure medication such as gabapentin (Neurontin). For a time this approach seemed stable, but new research into the brain, from mid-century and accelerating through the 1990s—the Decade of the Brain—revised scientific understandings of phantom pain and decentered understandings of the mind. This work proposed that the brain contained a geography of the body, that amputation involved rewriting of the map onto different parts of the body’s landscape, and that pain was a potential consequence of this rewriting. At the same time new therapeutic modalities were developed in part through innovations in understanding the role that mirror neurons played in the body’s ability to perceive the outside world. In the discussion on developments in neuroscience Crawford introduces Caspar’s notion of a “work object” (which shares some features with a ‘boundary object’), an object around which people organize their work practices and create meaning. Phantom pain, as well as prosthetics, can be investigated as ideas or objects in this context, but also are revealed as dense networks of social relations between individuals with amputations, amputated limbs, pain, prosthetic technology and the scientific activities of discovery and innovation. Connected closely to this is Crawford’s linkage, through Latour’s work, between phantom sensations or pains as actants. An actant is any agent that can associate or disassociate with other agents. This is particularly useful because of the way that Crawford sees phantoms as leaking around the edges of the taxonomic containers that are constructed to contain them. Despite their late introduction into the text these ideas permeate Crawford’s work and provide a helpful way to think through the development, flourishing and recession of ideas about phantoms that she details in her account. As an example of how biopolitics produces its object this book is a tour de force. Crawford moves deftly through historical periods and across disciplines, demonstrating how limb loss is rendered both visible and meaningful by scientists and clinicians. She makes and supports the argument that the experience of missing a limb is rendered legible by clinicians and then widely adopted, both by people with limb loss and broader publics. There are limitations to Crawford’s approach. With the brief exception of the introduction, we are rarely exposed to the voices of people with limb loss without the mediation of research scientists and clinicians. Of course in ethnographic work voices of research interlocutors are rarely available unedited, but the absence of this community is nonetheless regrettable, in part because it would have been interesting to see the way that the meanings and classifying strategies applied by clinicians and scientists were experienced and lived by individuals with limb loss. This would be particularly useful in light of Crawford’s focus on the way that the category of the phantom leaks around the edges of the various containers developed since the nineteenth century. Despite this concern Crawford’s book is a very important contribution to discussions about the construction of a technoscape made murky by the churning of constant discovery and innovation. Her conclusion, which focuses on both rare forms of phantoms (including penile amputations), and the potential presences or absences of phantoms in situations of elective amputation (among “apotemnophiles”), allows Crawford to consider how knowledge is produced and generates meaning for both researchers and for those it describes. Seth Messinger is an anthropologist and Research Director at the Center for Rehabilitation Sciences Research of the Department of Rehabilitation at the Uniformed Services University of the Health Sciences. Messinger S. Cassandra Crawford’s Phantom Limb: Amputation, Embodiment, and Prosthetic Technology. Somatosphere. 2016. Available at: http://somatosphere.net/2016/cassandra-crawfords-phantom-limb-amputation-embodiment-and-prosthetic-technology.html/. Accessed April 25, 2019. Messinger, Seth. 2016. Cassandra Crawford’s Phantom Limb: Amputation, Embodiment, and Prosthetic Technology. Somatosphere. http://somatosphere.net/2016/cassandra-crawfords-phantom-limb-amputation-embodiment-and-prosthetic-technology.html/ (accessed April 25, 2019).